K9 Gildon stood by Officer Jeff Felt’s side for over seven years beginning in 2006. 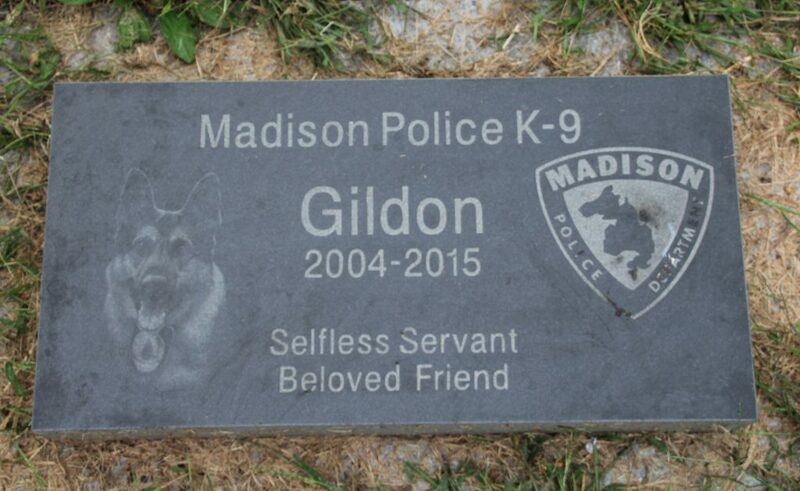 Gildon was a German Shepherd who assisted the Madison Police Department in hundreds of cases, conducting building searches, tracking criminals and missing persons, detecting narcotics, and finding evidence. Tracking was his specialty. In addition to the serious work, Gildon provided a lot of levity. “I can honestly say there wasn’t a shift that went by that he did not make me laugh out loud,” said Felt, reflecting on Gildon’s colorful career. Of all his career triumphs, one of the most famous was a SWAT call in 2013— a standoff that lasted 13 hours. In attempting to apprehend a dangerous suspect, Gildon was choked and battered in what Felt calls “one of the most violent encounters (he’s) experienced as a police officer.” The suspect was ultimately apprehended, and Gildon made a full recovery. 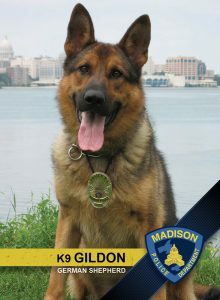 K9 Gildon was sponsored by Veridian Homes. He retired on December 1, 2013, and passed away on September 11, 2015. Read more of K9 Gildon’s most memorable calls. Donate to the Capital K9s Memorial Fund today!